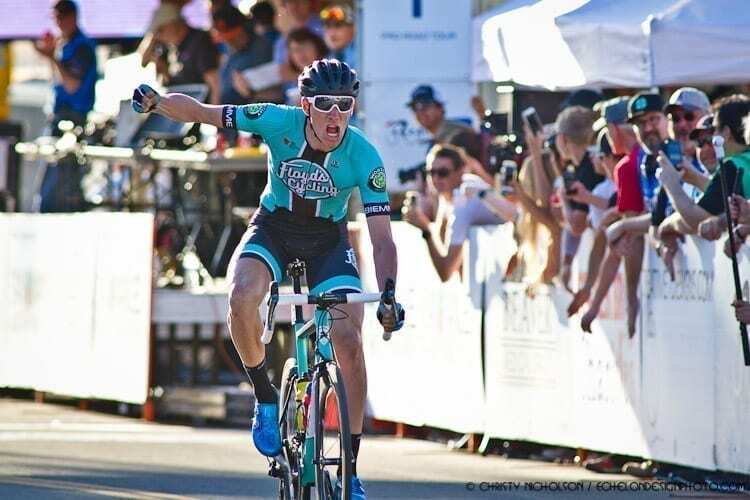 Noah Granigan outsprinted Scott Mcgill to win the Downtown Redlands Criterium Race on Saturday. A break of nine riders was established a few laps into the 90-minute stage, working together in order to fight for the win in the final lap. The 9-corner circuit was marred by several crashes that caused the race to be neutralized a number of times. Granigan had the extra kick in the final meters to earn the first Pro Road Tour stage victory for his new team, Floyd’s Pro Cyclery and the best result of his career. Scott Mcgill (Gateway Devo) finished just behind in second, with First Internet Bike Cycling, Jarret Oldham in third. Hagens Berman Axeon kept a tight leash on the escapees throughout the race, mostly to keep GC leader Kevin Vermaerke safe from the chaos of the day. The break also included Michael Hernandez and Alex Hoehn of Aevolo Pro Cycling, Hugo Scala Jr (Gateway Devo) and Michael Garrison helping his Landis Trek teammate, Quinn Simmons, extend his lead in the points classification. Simmons had initially missed the early move, until Garrison pulled him up to join the break, in order to fight Hernandez (Aevolo) for the 6 sprint lines available on the stage. The 17-year-old now holds a 10-point lead over the Aevolo rider. Alex Hoehn (Aevolo) was the highest placed rider in the break, sitting over 3 minutes down on GC. Back in the field, Elevate’s Jordan Cheyne, crashed upon crossing the line with 2 laps to go. 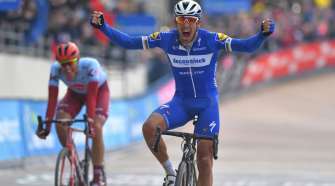 The Canadian was unable to finish the stage due to damage to his bike, but crashing in the final 3 laps allowed him to maintain his third place on GC. The leader classifications and top ten on GC remained the same ahead of the final day of racing on the Sunset Loop Sunday. Kevin Vermaerke (Axeon) leads the general classification, 24 seconds ahead of Eder Frayre and 27 seconds ahead of Cheyne (Elevate – KHS). The Beaver Medical Group Sunset Road Race men’s 94.1mile road race will begin Sunday at 2 p.m. LIVE streaming presented by Wildlife Generation and CycleStream.TV begins at 9:30 a.m. with our amateur races, before the pro races finale. 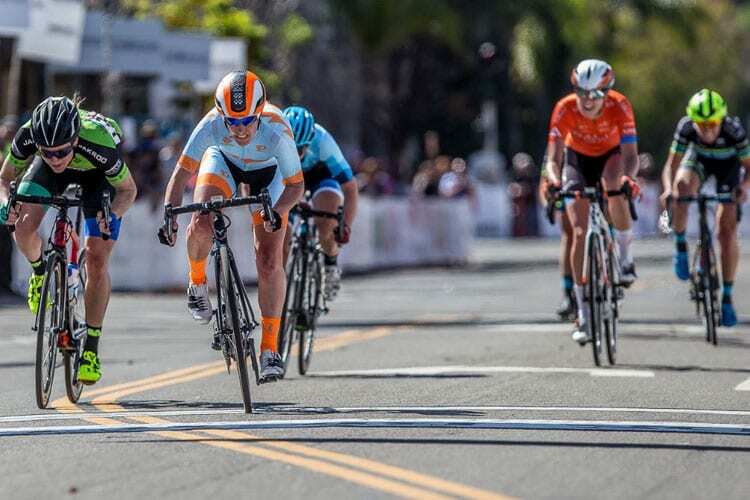 Rachel Langdon (Amy D Foundation) took victory in the Redlands Criterium today, sprinting from the breakaway ahead of sprint leader Lily Williams (Hagens Berman Supermint) and Helena Coney (Instafund La Prima). Langdon didn’t hold back around the final turn to the line and wound up a sprint that only Williams could challenge. Putting herself into the early move of six which included Williams, Coney, Abby Mickey, Emily Newsom, and Lauren Stephens, Langdon wasn’t guaranteed the breakaway would stick in the later part of the race, when Rally and Supermint began to drive the peloton closer. 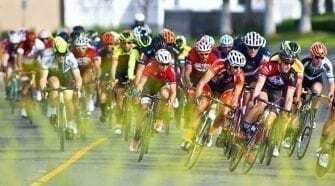 The hour long criterium in downtown Redlands has traditionally seen surprise finales and today’s action was no exception. Race leader Amber Neben finished safely in the bunch and starts tomorrow’s Sunset Loop Road Race a minute and one second ahead of Emily Newsom (Tibco). “Tibco, Sho – Air, Rally – all three teams are in the mix for GC, so it’s going to be a super hard day. 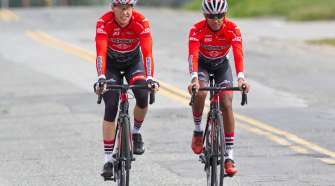 There’s a lot of racing ahead and there are no guarantees at this point,” Neben said. After the criterium, Neben was honored with the annual Redlands Classic Legends award, a testament to her ongoing legacy, on and off the bike. The award is usually reserved for a retired athlete, but Neben was this year’s exception.